After incurring sizeable losses in foreign exchange (fx) trading, HB had its banking licence withdrawn on 26 June 1974 by its Supervisor in Germany, the Bundesaufsichtsamt für das Kreditwesen. HB was not large: at the time it was the country’s 35th biggest bank. On this basis, its failure should have been a parochial affair. It was anything but. It precipitated a chain reaction across financial centres, which threatened to gum up the international payment system, as banks in different countries delayed settling with finality their payments to each other. The historical record of this international contagion in mid-1974 has been overshadowed. Instead, a related aspect of HB’s failure has made it an eponymous bank failure. 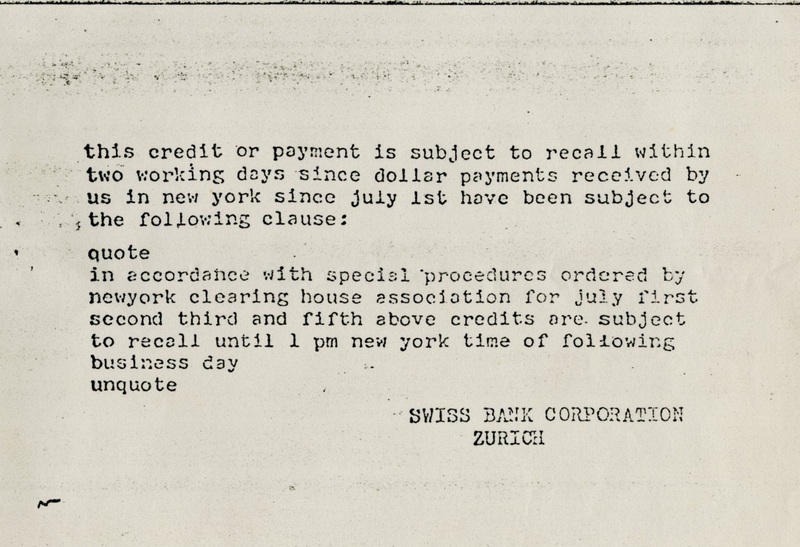 The Supervisor’s action occurred after close of banking business in Germany, but (because of the time difference) still during the business day in the US. Several banks had struck fx deals with HB, and they paid out in Deutschmarks, but did not receive the corresponding US$ payment in New York. HB’s counterparties stood to lose the principal amount of these deals. Thereafter, such fx settlement risk was also referred to as “Herstatt risk”. This latter aspect of the failure prompted work over the subsequent three decades to reduce settlement risk in financial market infrastructures. This has been well documented by policymakers (e.g. CPSS (1996); CPSS (2008)), and modelled by economists (e.g. Kahn & Roberds (2001); Schanz (2009)). Other research has taken HB as a case-study for early warning signs of bank crises (Blei, 1984), and for analysing changes to German depositor protection arrangements (Kaserer (2000)). But while Capie (2010) touches upon material in the Bank’s Archive that relates to HB’s failure, the story of serious disruption arising from cross‑border payment delays in mid-1974 has remained largely untold, apart from short passages in e.g. Reid (1982) and Goodhart (2011). So why might present-day policymakers want to reflect on this episode? Surely the introduction of real-time, gross settlement of payments, including so-called “payment-versus-payment” through CLS Bank for fx transactions – which was the ultimate response to mitigating Herstatt risk – means that the sort of seizing up of the payment system witnessed in 1974 would not recur in future bank failures? Not necessarily. 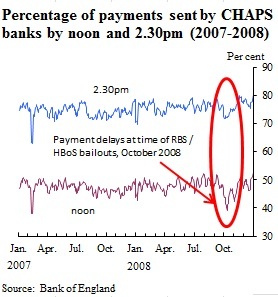 In the days just before the UK authorities intervened in October 2008 to rescue the Royal Bank of Scotland (RBS) and Halifax / Bank of Scotland (HBoS, by then, part of Lloyds Banking Group), there was evidence of non-trivial payment delays in the most critical UK payment system, CHAPS (see Chart; also Bank of England (2009); Benos, Garratt & Zimmerman (2012)). Central banks are working to prevent banks from being TBTF. When that has been successfully achieved, and a failing bank is no longer bailed out by the authorities, we could expect surviving banks still to delay payments. The risks from such delays are not of the same order of magnitude as the credit risk arising from banks failing. The authorities may, nevertheless, find it prudent at least to manage expectations in advance – that while they are doing everything feasible to make resolution of a large bank unremarkable, when such an event happens it will be difficult to avoid some messy consequences. Author: Ben Norman works in the Bank’s Independent Evaluation Office.